The career of Wild Bill Moore, session tenor saxophonist turned solo recording star in less than a year, has been exactly the kind of rags to riches tale that feeds the early morning dreams of struggling musicians and keeps them from pawning their instruments and heading back to the sticks to get a job bagging groceries or pumping gas. While skill undoubtedly played a role in his rapid ascent so too did timing as he came along at the precise moment when a new style of music called rock ‘n’ roll was just appearing on the scene and in need of musicians who could replicate the type of excitement its fans felt when hearing it. His knack for perfect timing was further exemplified when he found himself promoted from being a supporting player alongside the first rock instrumental sax star, Paul Williams, to the featured musician – with Williams backing him no less – on his own series of records cut in the days leading up to a prolonged musicians strike which forced record labels to stockpile material in the hopes of outlasting it. Those two events combined to give Moore an opportunity he might otherwise have waited a lifetime for and in the process he was thrust into the spotlight and greeted with adulation for embodying the very things that rock was making its name on. He himself had even helped in that regard by naming his hit record We’re Gonna Rock to further solidify the connection all of which was a confluence of events that you’d be hard pressed to draw up any better. Now with his own name established and the recording ban over allowing everybody in the industry to catch up to the precedents he helped set down and possibly take them even further, we meet up again with Wild Bill Moore and… find him reduced to releasing a record cut way back in December 1947 before any of that life-altering success had come his way. The independent record industry of the 1940’s was a very tenuous proposition for label owners who started their businesses with little more than blind ambition and grim determination. Savoy Records was the first notable success in the field arriving on the scene in 1942 when Herman Lubinsky, a crude and often obnoxious man with absolutely no musical know-how, went from owning an electronics store in Newark, New Jersey to operating a record company and somehow made a go of it. Savoy’s formula was rather basic but very effective – target the musical niches and corresponding audiences not served by the major labels (IE. predominantly black music, be it jazz, particularly bop, gospel and eventually some rock) and hire skilled producers who also served as talent scouts and let them operate freely… all while paying them less than nothing and berating them at every turn until they left under a cloud of resentment. Lubinsky’s reputation as a cheapskate was no exaggeration and while I’m sure he convinced himself that saving pennies was what kept him solvent in the end it wound up costing him far more than he ever was able to save as his best people all abandoned him when he reneged on his promises for compensation over the years. So now we find him in another self-inflicted bind as his contract with Wild Bill Moore had run its course and Moore is on his way to Modern Records across the country, his second such loss of a major sax star in recent months after Big Jay McNeely recently departed for a California label as well. In each case Lubinsky had only signed them to short-term contracts and so with hits under their belts and with bigger offers on the table they jumped ship leaving Savoy to go dredge up the remaining tracks in hopes of getting one last hit which may ultimately benefit Lubinsky’s competitors as the records would act as promotional tools for the artists more recent work on other labels. I’m not entirely sure the actual origins of the title of this song. As stated many times here instrumentals were given titles for a wide variety of reasons from naming them after radio dee jays as a form of inducement to play the record to trying to find a remote connection between the potential audience and something they were familiar with, such as particular food dishes favored in that community. But South Parkway Hop may have to do with the Garden State Parkway in New Jersey, which was begun in 1947 but by 1949 they were still waiting for it to be more than a glorified side street. Who knows the whole story, it doesn’t really matter much anyway, but the title is reasonably catchy and it’ll need to be to draw attention for a song that is now fifteen months behind the curve stylistically. Luckily the musicians here are the same ones who played on all of Moore’s records as well as Paul Williams’s hits of 1947/1948 and so they’re certainly more than competent, but in a style that moves ahead as fast as rock ‘n’ roll – especially during the transition from a fledging movement to an outright phenomenon that marked this fifteen month journey – they’re going to be hard pressed to fit in with something this old. Surprisingly its not the arrangement of the song that sticks out like a sore thumb. Its structure is actually still fairly relevant to the more recent advances in the field of rock instrumentals. It may be a little more subdued at first but this is hardly anything that would disqualify it from consideration amongst rock fans in the spring of 1949. There’s no moldy jazz attributes to contend with, no ill-chosen flourishes by Phil Guilbeau’s trumpet to interfere with the mood and certainly the rhythm section consisting of T.J. Fowler’s piano and Reetham Mallett’s drums is up to par, laying down a steady hypnotic floor for the others to strut across. Paul Williams on baritone handles the underlying riff as capably as ever, finding the groove and sticking to it and giving the song its most captivating melodic hook in the process. There’s nothing intricate about it but you’ll remember his part more than anything else here and while its concept is fairly simple it’s the most effective aspect to the song, giving you a familiar refrain that sticks in your head long after it ends. The problem lays with Moore himself who sounds a little bit uncertain at times, a little bit out of tune at others and arguably even a little bit drunk at first as he struggles to get in sync with the rest of the band. His tone just is a bit off here. There’s either too much separation between him and the others or not enough, take your pick. His tenor is stuck in the middle ground of its range and as a result comes off as sounding whiny. Like a restless kid stuffed in a back seat on a hundred mile trip to his grandmother’s house, he’s fidgety as he tries to get his bearings which throws off the balance the others are striving for and otherwise achieving on their own. What he needed to do was drop down and play in a lower register to emphasize the groove aspect of this, which is something that would work quite well. But of course being December 1947 they didn’t know this yet because there was no precedent for it since Sonny Thompson’s Long Gone in which Eddie Chamblee’s sax showed one and all how effective such an approach could be had yet to be released when this was cut. Thankfully there was also no precedent at the time for the obscenely squealing workouts that would soon define the other side of the sax instrumental coin in rock. While that approach would soon prove to be explosive and would provide rock with some of its best sides over the coming months it certainly wasn’t what would’ve elevated this particular record. If anything it’d have made the two components clash even more. As it is they’re still clashing, but doing so rather amicably. Its discordant sounds are a little annoying for sure, but tolerable if you focus more on the underpinning. By the minute mark Moore settles into the range he belongs in for this piece and it feels a little more comfortable for them all from there on in, maintaining a pleasant groove without much fanfare. Since the dominant theme of this review is the contrasting expectations for a rock instrumental between the point it was recorded and when it was finally released it’s only fair that we try to put the record into both contexts in order to better evaluate it as a recording. Had South Parkway Hop been released in January 1948 in place of the surprising minor hit Bubbles, a bland and uninspiring piece of lightweight fluff, this would fare much better in our assessment. Then its churning groove would’ve stood out more in comparison to the music surrounding it because that aspect hadn’t fully been exploited yet. It’s not a stretch to say that for that specific point in time this would’ve been an above average release, earning a (6) even in spite of the awkward first minute of Moore’s performance. If instead it had been issued in July 1948 in place of the great We’re Gonna Rock, which had pushed the form ahead by leaps and bounds, this wouldn’t have quite been able to live up to the standards set by other records released over the previous few months such as Williams’s The Twister and Earl Bostic’s Temptation, not to mention the Sonny Thompson cut, which would’ve made this record’s flaws more noticeable than they’d have been the previous winter. Yet because we would’ve been still waiting to hear We’re Gonna Rock, not to mention equally sizzling sides from Hal Singer and Big Jay McNeely, this probably would’ve earned a (5) as a fairly average cut for the summer of ’48. But not anymore. Now as winter turned to spring in 1949 the sounds have taken another huge leap forward and anything from this far in the rear view mirror is bound to suffer by comparison. The records of this ilk have gotten far more complex, utilizing more sonic textures and more creative arrangements. It’s not exciting enough to compete with the flashier sides, nor is it addicting enough to take its place alongside the best of the sultry grooves we’ve heard along the way. Even so however I can’t dock it TOO much because what we’re left with still works reasonably well. The biggest flaw isn’t found in anything that’s outdated, which says a lot about their initial instincts when it comes to crafting these records, and if not for one tonal misstep by Moore that dominates the first minute this still would be more than acceptable as a jukebox staple in 1949. Not as the biggest nickel grabber in the machine but certainly as something worth wiling away to as you wait for your next beer or chocolate soda. 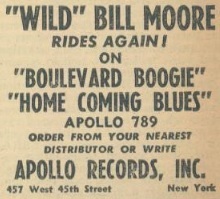 The funny thing is Moore was actually competing with an even OLDER version of himself as Apollo Records, for whom he cut some sides a few years earlier, re-released two of them this same month, advertising them as if they were new to take advantage of his recent successes with more modern material. I suppose though its only fair that this does come up just short of the break even point. Moore benefited from good timing as much as anybody with his earlier successes, while here he suffers from bad timing thanks to Savoy saving this record for last, so it all may even out in the end. The only real loser in all of this is Herman Lubinsky who not only may have cost himself a hit by keeping this until past its expiration date but also lost the musician who’d given him those earlier hits. You’d think that since record labels were notorious for gypping their artists when it came to paying them fair royalties they’d have figured out a way to lock them up in convoluted long term contracts that paid them a pittance as well. When looked at that way I’m sure Wild Bill Moore would be the last one to complain about this leftover side being his epitaph on Savoy now that he had his freedom. I hate to admit it, but if not for Wild Bill himself, this one would likely be “7.” I really like the underlying riff. As it is, I’ll give “South Parkway Hop” a “5.” It did make me dance after all. 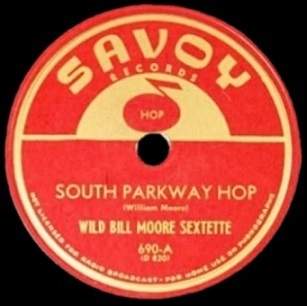 Leave a reply on "Wild Bill Moore: “South Parkway Hop”"